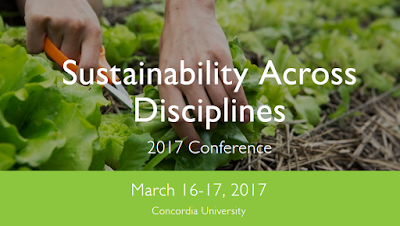 This interdisciplinary conference will take place March 16 - 17, 2017, 9:15 a.m. – 5:30 p.m. at Concordia University, Room GN M-100 and MB 6th & 2nd floor, Grey Nuns Building (Main Entrance 1190 Guy St.; Class Entrance 1175 St-Mathieu St.), Sir George Williams Campus. 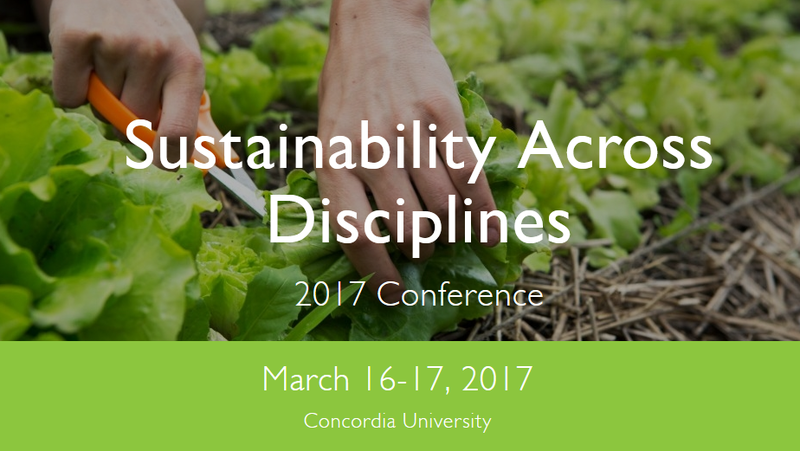 The Sustainability Across Disciplines Conference will examine sustainability research across disciplines and will feature faculty, graduate student, and undergraduate student work from across Concordia University. This event is brought to you by the Loyola College for Diversity and Sustainability and the Loyola Sustainability Research Centre in conjunction with the Office of the Vice President of Research & Graduate Studies; the Faculty of Arts and Science; the John Molson School of Business; the Departments of Biology; Geography, Planning and Environment; History; and Design and Computation Arts; the David O’Brien Center for Sustainable Enterprise; the CN Centre for Studies in Sustainable Supply Chain Management; the First People's Studies Program; the Mechanical and Industrial Engineering Graduate Student Committee; and the Centre for Engineering in Society at Concordia University. Dr. Daniel Simberloff, Gore Hunger Professor of Environmental Science at the University of Tennessee. March 16th, 1:30-2:30 PM in GN-M-100 (1175 Rue St. Mathieu). Dr. Marian Chertow, Professor of Industrial Environmental Management at the Yale School of Forestry and Environmental Studies. March 17th, 9:30-10:30 AM in MB 6.260. Bishop Sofie Petersen, Bishop of the Lutheran Church of Denmark. March 17th, 1:30-2:30 PM in MB 2.210. Dr. Carmela Cucuzzella, Associate Professor and Concordia University Research Chair in Integrated Design, Ecology, And Sustainability (IDEAS) for the Built Environment in the Department of Design and Computation Arts. March 16th, 9:30-10:30 AM in GN-M-100 (1175 Rue St. Mathieu). Dr. Damon Matthews, Associate Professor and Concordia University Research Chair in Climate Science and Sustainability in the Department of Geography, Planning and Environment. March 16th, 4-5 PM in GN-M-100 (1175 Rue St. Mathieu). To conference conference, there will be a plenary discussion on research across disciplines featuring Drs. Ketra Schmitt (Centre for Engineering in Society), Jochen Jaeger (Department of Geography, Planning, and Environment), and Ricardo Dal Farra (Department of Music). March 17th, 4-5:15 PM MB 2.210. For the full conference program and more information about the conference click here. when you select Register on the registration page, you will be given the choice of registering for each keynote address separately or of registering for the whole conference, including the keynotes.